Bruno Di Pietro was born in Pescara (Ripacorbaria) on June 4, 1947. In 1950 his family emigrate to Argentina. Back in Abruzzo in 1953, he settles in a quiet country village a few km far from Chieti. Early in his schooling, he manifests his passion for drawing and watercolour and frescoes hunting scenes, landscapes and flowers on the walls of his house; he also follows a drawing and perspective course by correspondence. A nail to the wall is his first easel; the under-stairs, cluttered with shelves and demijohns, is his studio. There, he creates the first paintings on canvas which the artist shows in the Summer on the sidewalks of the promenade of Francavilla, Pescara and Pineto. That is the period when his passion for horses explodes, a passion probably born by reading Tex Willer comics which deepens with the habitual visits to his uncle who was a horsemanship instructor. In 1968 the artist leaves to serve in the army in Sardinia where he is able to carry out about 15 oils on canvas and various collages on cork trunk sections. In 1970 Di Pietro moves to Milan in search of job opportunities. In 1971/1972 he attends the Academy of Brera directed by Professor Pompeo Borra and then he signs a contract with Eng. Bonetti – an entrepreneur, a patron of artists and the owner of the Gallery “Antiquaria delle Orsole” who organizes a big solo exhibition of his works which is followed by other exhibitions with great contemporary masters such as Guttuso, Migneco, Fontana, de Chirico, Dova and Bay. Thus Bruno Di Pietro’s real adventure in the art world begins. Those are the years of Milan referred to as “the European capital of Art” by Indro Montanelli in the Italian newspaper Corriere della Sera. The artist holds a series of group and solo exhibitions in various cities in Italy and abroad. Because of his versatile eclecticism, tireless research, curiosity and commitment, the artist receives numerous awards and recognitions. In 1972 he moves to Paris, where he can make contact with artists in the city. While attending the “Maison Americaine” in Boulevard Raspail, he learns the techniques of silk-screen and etching printing. In Paris he makes a series of milk tempera and oil paintings on canvas, mostly made extemporaneously, which are kept in private collections in Paris and Milan. 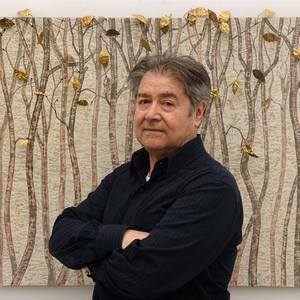 Following his taking part in group exhibitions with young American artists, he is reviewed, in the Revue Moderne, by Professor Montoya who compares his painting to Albrecht Durer’s. Later he moves to Brussels. In 1972, in St. Moritz, he meets Sophia Loren and Carlo Ponti and the Zambeletti family. In Portofino he meets his compatriot Michele Cascella. Back in Italy, in Venice, he makes several drawings and oil paintings on canvas. In Milan he is a member of the prestigious and renowned“Art and Patriotic Society” and so he is invited to preside over juries, to take part in important awards and international competitions. The artist is an active member of S.E.P.A.S. (Union of European Artists in Milan) and a founding member of “Annamaura” Art Association. In the following years important solo and group exhibitions are organized for him all over Italy, from Milan to Taormina, so today his paintings are permanent works in art galleries and private collections. In 2000 he goes back to his Abruzzo where he sets up his studio in Villanova (Pescara), among the Maiella mountain range, Gran Sasso, the sea and the highways which, in the meanwhile, have spoiled the idyllic landscape of his childhood. Up to now, the artist has created about 4,000 works: oil paintings, sculptures, collages, drawings, silkscreen and etching prints, engravings and mixed media, as well as thousands of calendars and art collections. Bruno Di Pietro is an Honorary Member of Accademia d’Abruzzo and a member of WWF.